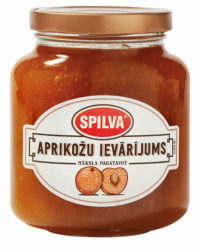 Jam is made of qualitative dried apricots. Best with pancakes, ice-cream, or on fresh bread with milk. Product is filled in 0,44 l glass jars. Shelf life of jars – 24 months; pails – 12 months. Product 100 g contains: – 217 kcal (908 kJ), protein – 1,4 g, carbohydrate – 55,5 g, fat – 0 g.